Chemical peels are a great way to improve a multitude of skin concerns including pore size, fine lines and wrinkles, discoloration, sun damage, active acne and acne scarring. We offer a variety of different strengths and formulations to customize for your specific skin concerns. Custom peels will help address a particular problem area or special skin type so that your results and your satisfaction will be maximized. Treatment time is 30-45 minutes and recommended treatments are every 2 to 4 weeks depending on the severity of the condition being treated. Application of the peel on your skin, is done in stages. It will stay on for a few minutes and typically more layers will be applied. You may feel slight stinging, burning or discomfort during a peel (the stronger the peel, the more you may feel), which means the acids are working their magic. This sensation will last the duration of the peel. 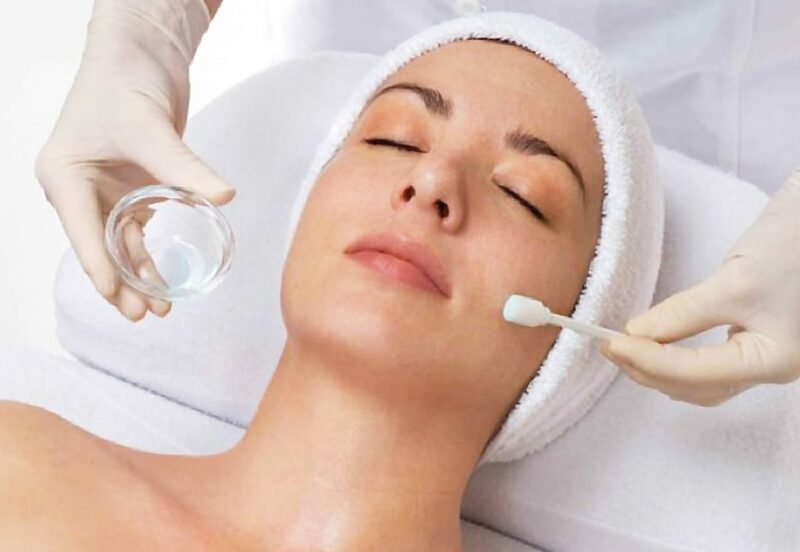 Most peels are self-neutralizing, requiring no further steps after delivery. The sensation of tingling, stinging or heat can happen in a few seconds or a few minutes and can reactivate if re-moistened. The whole process from start to finish can take, on average, one to 10 minutes. In the coming days following a peel, your skin may have slight redness and will feel dry. Peeling can occur within two to four days and you may peel up to a week. Everyone’s response to peel is individual based on both the peel itself and your skin. Peels can differ in formulation, strength, composition, different skin types react differently to any peel with a varying level of sensitivity. Deeper and stronger peels can exfoliate multiple skin layers, resulting in temporary red, flaking and peeling skin, with a tight or swollen feeling. Some peels, like glycolic and lactic acid types, are known to be more hydrating, so there’s less redness and dryness, while bacteria reducing salicylic peels result in dryness and red irritated appearance. Once your skin has healed from any redness and peeling, you’re left with skin that is pretty much flawless. Don’t be afraid to get down and dirty with your skin to reveal optimal radiance. This peel is for people serious about making a difference in their skin. The Perfection Lift chemical peel is by far the most popular peel at our spa. It helps improve a variety of skin conditions, including hyper-pigmentation and acne scars. It also helps reduce deep lines and signs of aging by peeling off the external dead layer of skin. Boost the lightening effects of this peel with lactic & kojic acids, plus added retinol for the maximum treatment of even the most stubborn pigmentation. This chemical peel helps to reverse the visible effects of damage in two ways. First, it powers away dull, dead cells to illuminate the skin and reduce the appearance of fine lines, wrinkles, age spots, clogged pores and blemishes. Then, it supports collagen for firmer-looking skin over time. This results-driven treatment combines the most innovative and effective botanical brighteners with echinacea, plant-derived stem cells and anti-aging peptides for youthful, illuminated skin. 50% LACTIC ACID: exfoliates, compensates for skin tone and inhibits tyrosinase production.